A store may seem like an unlikely location for a fashion exhibition, but for the past several weeks the Prada Epicenter in Soho has transformed itself into a quasi-museum like environment, displaying a retrospective of Miuccia Prada’s skirts (the exhibition closes tomorrow). Stores, more specifically department stores, have a history of displaying fine art among the more quotidian purchasable goods as it was common practice in the nineteenth-century to transform a hall of commerce into a kunsthalle. However, entering the Prada Epicenter is a bit disorienting. One’s not sure what’s on display and what’s for sale. But then again those items on “exhibition” were also for sale at on time or another. One supposes that’s the problem when the “designer who’s done more for putting women in skirts than any other contemporary designer” mounts her own retrospective. Perhaps, the exhibition would have felt less like an advertisement if other skirts from other designers were included. But one can’t help but marvel at the sheer beauty of the displays. Skirts become artfully camouflaged wallpaper when mounted on uninterrupted yardage of the same textile. 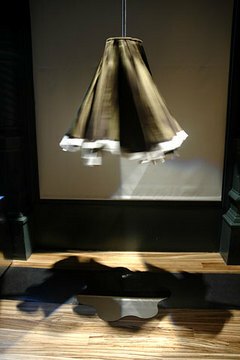 Skirts playfully twirl and kick, begging the viewer to come and pet them, something one can never do in a museum. Bug-eyed magnifying glasses emphasize tiny metal knife and fork appliqués on one skirt and crystal embroidery on another. One walks away confounded, wondering if Prada’s determination to turn clothing into exhibition-worthy art is obnoxiously pretentious or refreshing.